Lakeview Hospital was founded in 1976 to meet the needs of a growing population in Bountiful, Utah, a community of 41,000, located 12 miles north of Salt Lake City. Today, Lakeview has 128 licensed beds and averages more than 3,500 inpatient admissions annually, staffs 111 Physicians, 600 employees, and 130 Volunteers. Lakeview supports specialty services that include: Healthworks/Occupational Health, Diabetes Treatment Center, Sleep Disorder Diagnostic Center, Utah Center for Wound Healing and Hyperbaric Medicine, Rehabilitation Center, and Transitional Care Center. The ED supports up to 13 beds that includes three cardiac/trauma beds, one OB bed, one casting bed, one orthopedics bed, and one ophthalmology bed and has approximately 17,000 emergency department visits per year. Lakeview ED nurses have received several awards including "Nurse of the Year" for Davis County. The ED medical director also serves in the same position for the Bountiful Fire Department and EMS. 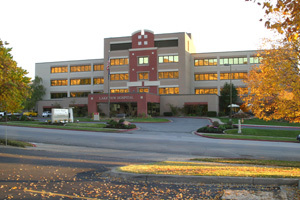 Lakeview Hospital is located at 630 East Medical Drive Bountiful , UT 84010. To view their website click here.